I thought these were really good. The last time Sonia and I had eclairs, we were in Vegas at one of those all-you-can-eat buffets, and they had eclairs out on their pastry table. And boy, these Vegas eclairs were disgusting! Worst. Eclairs. Ever. So, after that experience, it didn't take much to impress me. 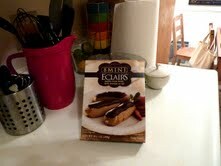 I thought these Trader Joe's Mini Eclairs were tasty. The chocolate and the filling were very good. I must admit, the bread was a tad dry. That's what got Sonia. She is an eclair enthusiast, and she wasn't thrilled with these. She'll admit they were better than the Vegas buffet eclairs, but still not up to par with the fine pastries she is accustomed to. Once these eclairs sat around a bit longer, they got slightly more moist. They come frozen, and you're supposed to eat them thawed. The only one Sonia had was about an hour or two into the thawing process. I think they need a little longer than that...For pre-packaged, frozen eclairs, I don't think you can expect too much more than what TJ's delivers. I give them Four and a half Stars out of Five. Sonia gives them Three and a half. Bottom line: 8 out of 10.